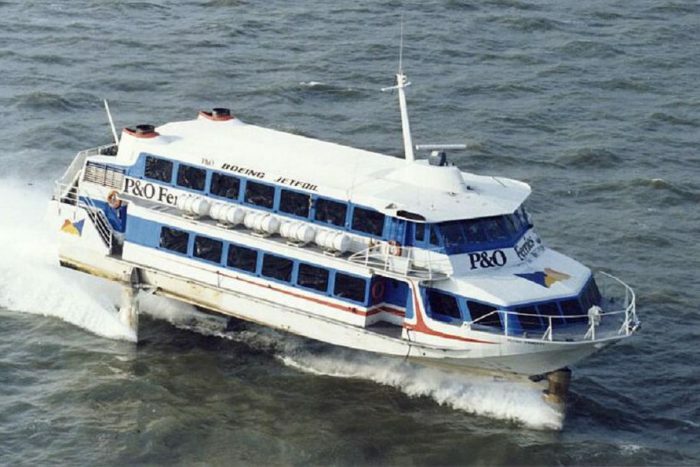 The 929 series Boeing Jetfoil high speed passenger ferry was initially designed and constructed by the Marine Division of the Boeing Company of Seattle, Washington. Latterly, the licence to develop and build the type passed to Kawasaki Heavy Industries, Japan. The craft is a direct descendant of a research and development programme carried out by the United States Navy during the 1960’s to examine the technical feasibility of a vessel which could deliver the fire-power and operating capabilities of a destroyer but at speeds in excess of 50 knots. In 1978 the 929 -100 was developed into the 929 – 115 model. Jetfoils have been operated in UK waters by both P&O and Regie voor Maritiem Transport (RMT). GTS Funchal, ex JetFerry One – Aluminium 929-115 series Jetfoil high speed passenger ferry built in 1981 by Boeing Jetfoil Industries, Seattle, Washington, U.S.A. (Yard No 13) for Boeing Marine Systems, Seattle, USA.